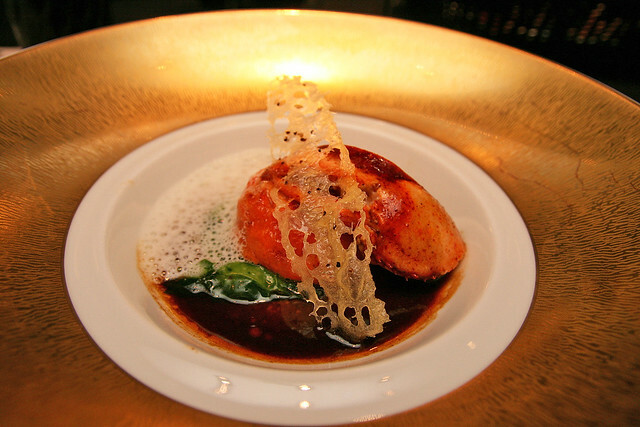 UPDATE 2016: Joël Robuchon Restaurant was awarded three Michelin stars, the only one in Singapore. L'Atelier has two stars. Joël Robuchon was in town recently to present some new dishes. This is the third time I have met the man with the most Michelin stars in his restaurant collection - when he first came to announce his restaurant concepts at Resorts World Sentosa, and later when he came to open them. He actually comes here quite often, once a quarter, I hear. 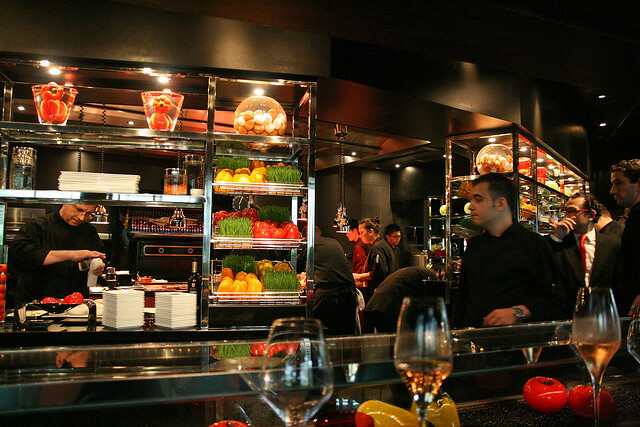 This time we got to get step in and take a peek at the Joël Robuchon kitchen! It was eye-opening. Oh man, it's so chic, clean, full of character...and not cramped! Love the checkered patterns, bold contrasts and the brushed steel elements. I had to take a photo and put it up on Instagram immediately. 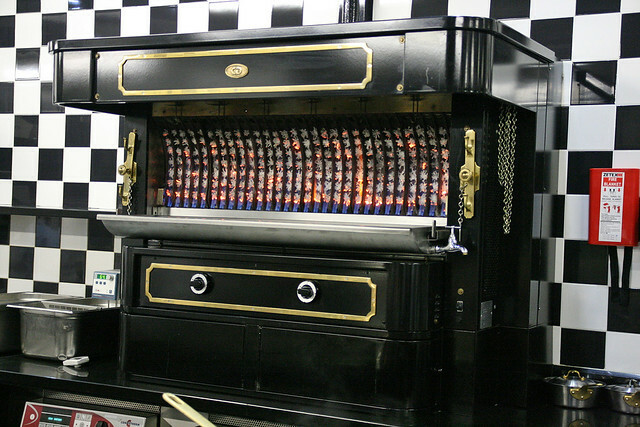 Now that is an awesome grill - we could feel the heat from across the room when they fired it up. We were also treated to a short cooking demo by Executive Chef Tomonori Danzaki (I previously had the pleasure of witnessing his DBS Masterclass where he showcased three of their recipes). Next to him is Restaurant Manager Guillaume Anglade, who also helped with some French interpretation. 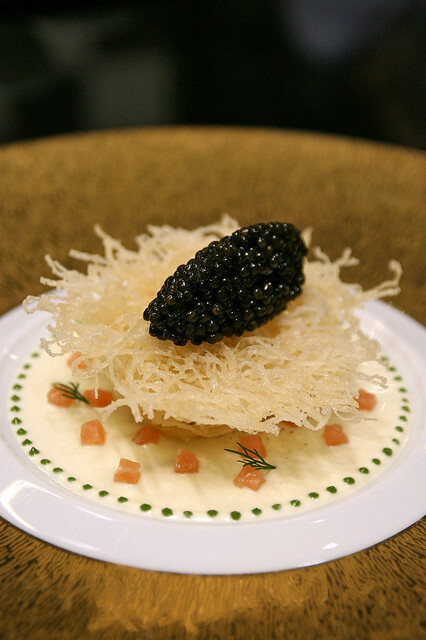 Poached egg wrapped in shredded filo pastry, topped with caviar and placed on a cream base with miniscule-cubed salmon. And the signature dots in green. There are new dishes at both restaurants. 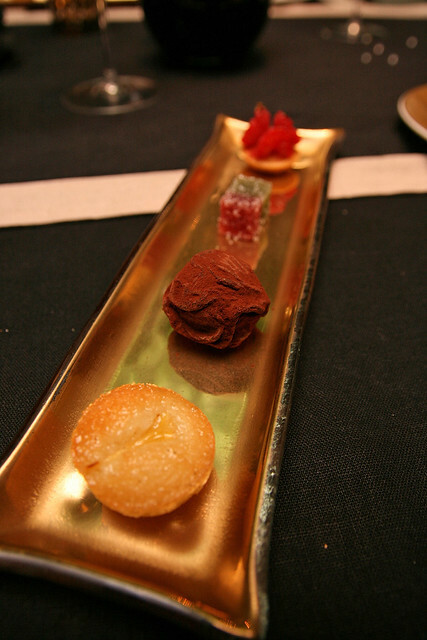 We first tried the ones at L'Atelier de Joël Robuchon. The L'Atelier is gorgeously decked out in black and red lacquerware colours. 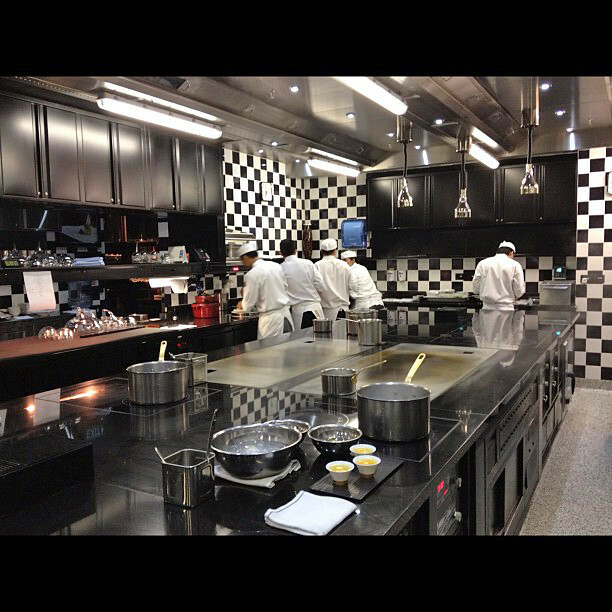 The display kitchen is where they make your meal, and the servers engage with diners in friendly banter. Refreshing gelee, creamy avocado and juicy grapefruit combine to make your mouth water, but I did feel it was a little too tart (possibly my segment of grapefruit). 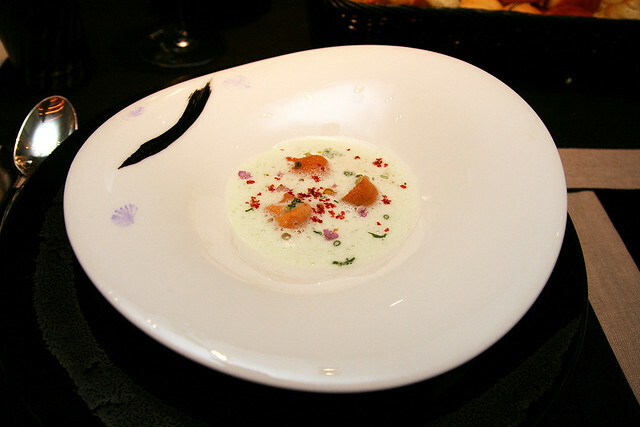 The corn veloute is made with Japanese corn - it's beautifully sweet, silky and smooth. 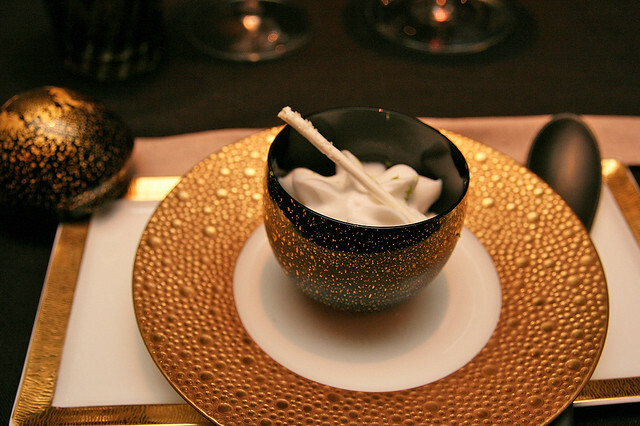 The beef jelly gives it a savoury boost, and the caviar completely brings it over with an umami tang. Fabulous - loved every drop of this. 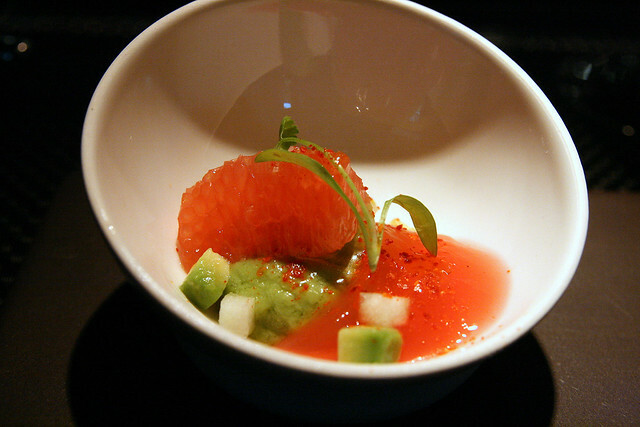 This particular dish is really a showcase of how quality produce needs little else to deliver. 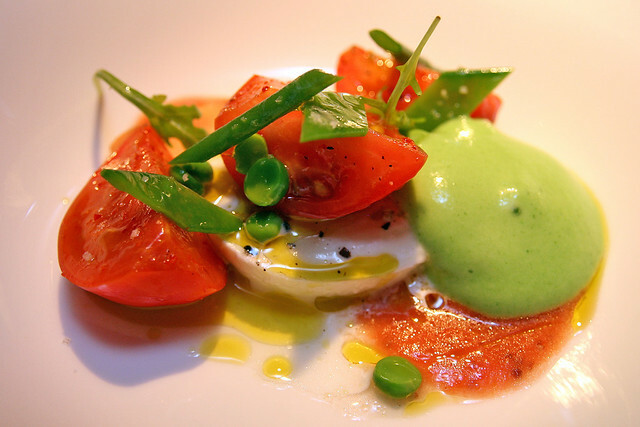 Sweet tomatoes, good olive oil, and fresh mozzarella. It also tasted really healthy. 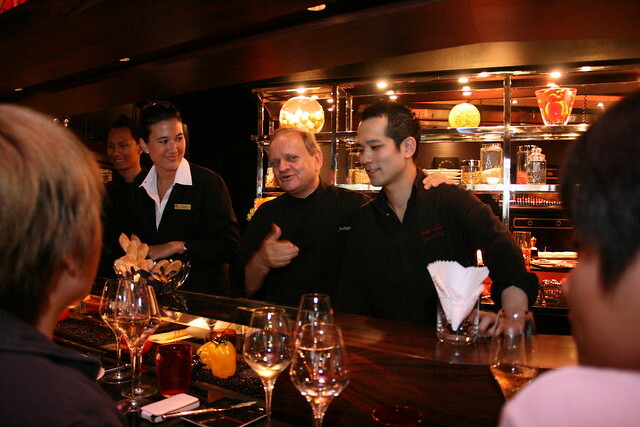 Joël Robuchon himself was in the kitchen putting together some of the dishes. Here he is introducing Chef Yosuke Soga, the Japanese guy who helped him start L'Atelier in Tokyo. Yosuke is the one who designed the next dish. This had all the tastes of an exquisite omelette, but in comforting soft-boiled form. All thanks to the flavours of peppers, onion, and Iberico ham with a dash of piment d'esplette - the chile pepper of Basque country. I absolutely loved this dish, although HFB next to me didn't quite take to it. 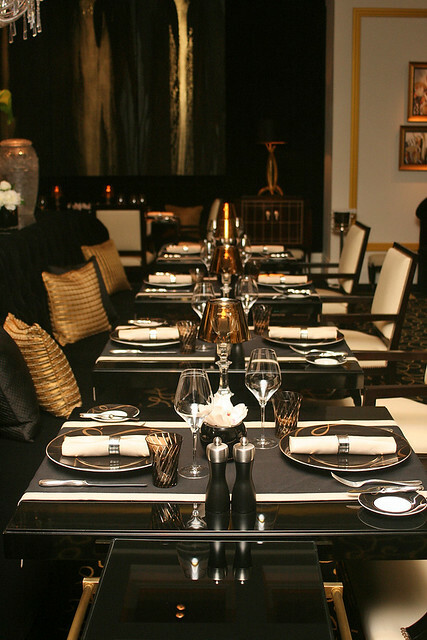 We next moved to the Joël Robuchon Restaurant, which is so very fine and elegant. The media guests sat in the Winter Garden, which houses a tree in a sunlit room. This is a photo from a previous visit when it was still daytime - it's beautiful with natural lighting. 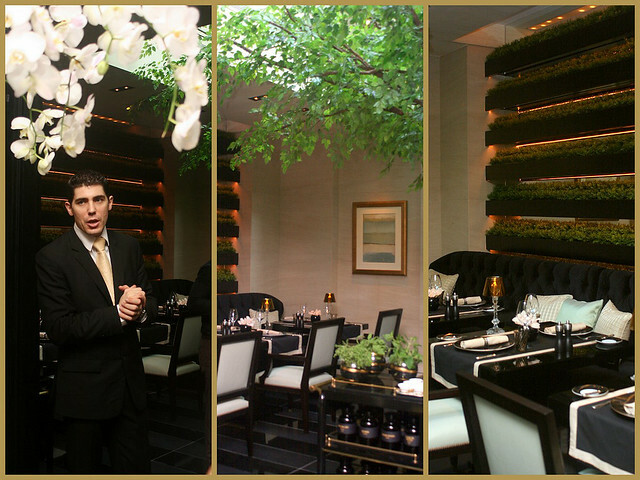 As it was evening when we dined, the room was bathed in soft romantic lighting instead, giving the place a whole new feel. Oh the breads! 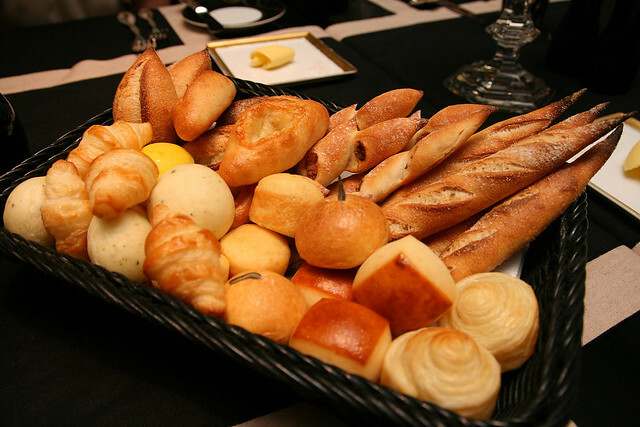 We already ate almost the whole shared basket over at L'Atelier when we were presented with an even bigger array here! But they are so good, we had no regrets filling ourselves up with carb. Yoshihiko Tauchi is the baker chef to both restaurants, responsible for these beautiful creations. 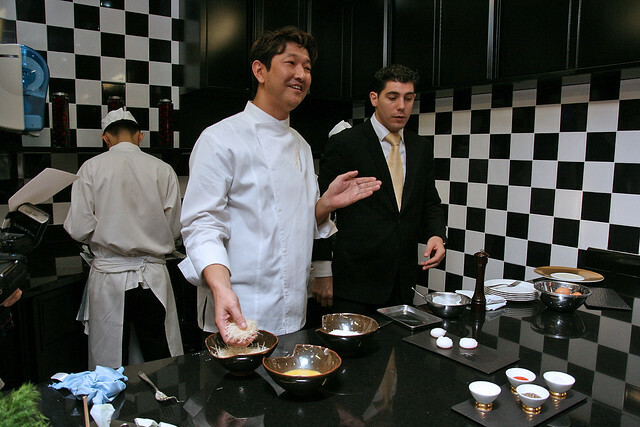 Chef Tauchi was baker chef at La Boutique de Joël Robuchon in Japan for seven years before coming here. The Robuchon restaurants have an exclusive bakery in the central kitchen of Resorts World Sentosa where they make all of this. 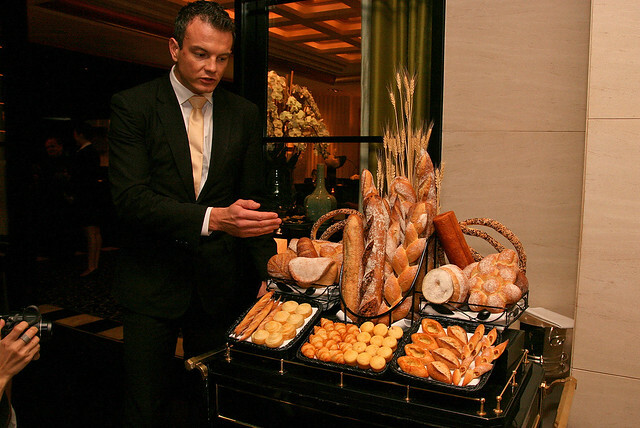 There's more bread on the bread trolley - possibly more than 15 varieties. Toss your low-carb ambitions aside just for a day and indulge. I really wish they would start selling their bread (ideally in town)! 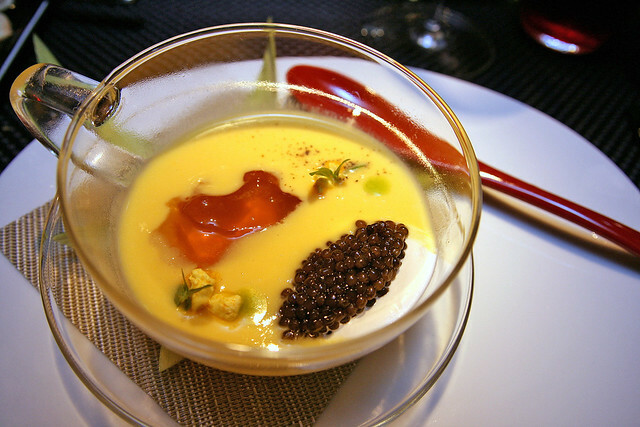 And now for the new dishes at Joël Robuchon restaurant. We were first presented with this very pretty plate. Look carefully at those decorative flourishes on the plate - the black stroke and little lavender blossoms - these are hand-painted by the chef! I heard it was Danzaki, who's quite an artist. 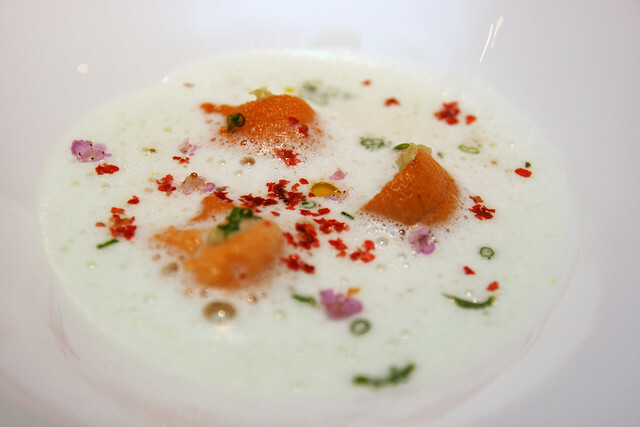 Three generous chunks of uni bathing in an almost whimsical wasabi foam and flower bath. We were told a zephyr is something between a creme blanc and a souffle. The fresh sea urchin and slightly sweet wasabi totally hit it off. Wow, this was intense! 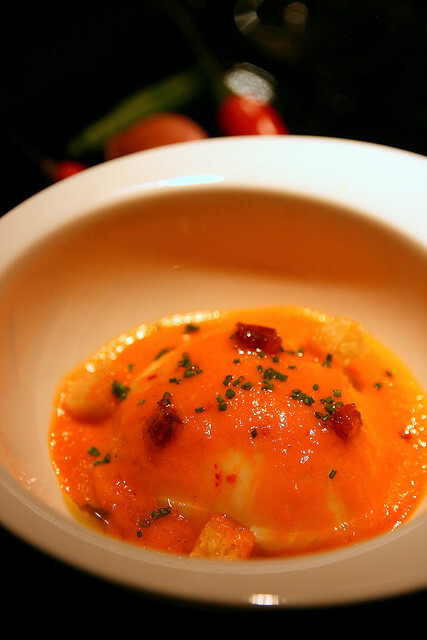 Robuchon's take on our black pepper seafood is a real winner. The lobster claw is beautifully roasted and the dark sauce is unabashedly spicy and concentrated. 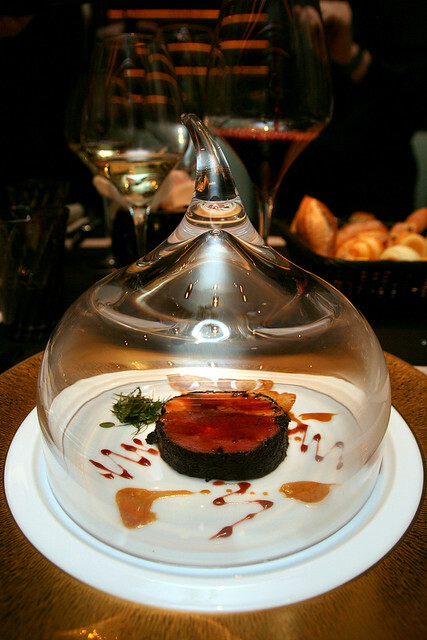 The beef fillet Rossini style came shielded in this dramatic glass dome. Heavens! 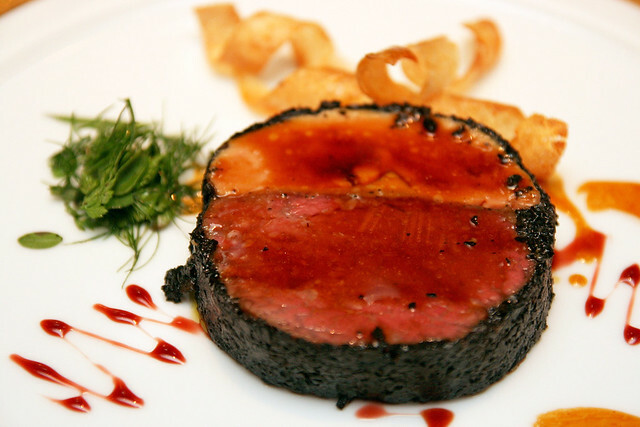 Beef and foie gras together! Indulgent? Yes,but they so gloriously deserve one another's company. The beef is so tender and flavourful (we found out it was cooked sous vide style). And the foie gras adds even more richness and fatty flavour. Oh, and please eat the bitter salad sprouts - they have been carefully picked and assembled - and actually help take a bit of the richness off your tongue. Love the potato curls in the background too. 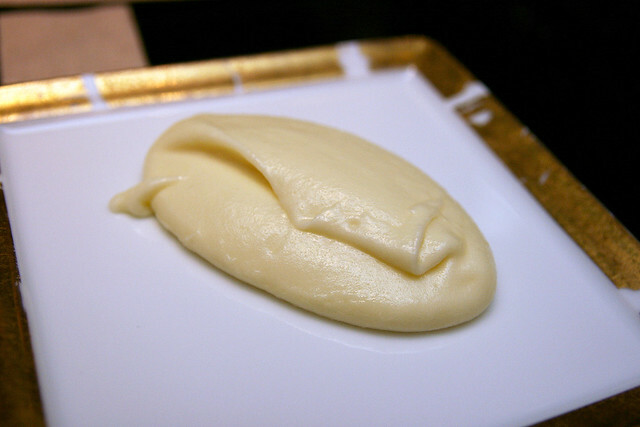 The famous uber-creamy mashed potato - some guy in the kitchen has to whip these for several hours to achieve that incredible texture. Pre-dessert - The Le Parfum de Iles - smooth passion fruit, rum granite, light coconut foam. Love the combination. I had this at the L'Atelier side on a previous visit. I remembered the name, although the presentation is quite different this time. The presentation for this absolutely floored us. We practically didn't know where to start but ooh and aah for a while. 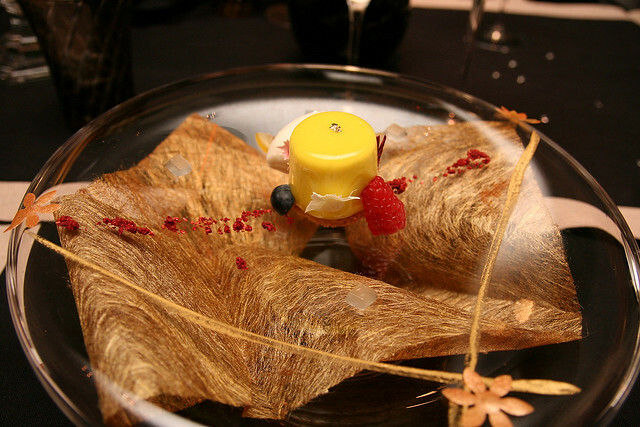 Desserts at the Robuchon restaurants are usually quite an experience. Their Pastry Chef Antonio Benites was previously executive chef at world-renowned pastry boutique Pierre Hermé in Rue Bonaparte, Paris. 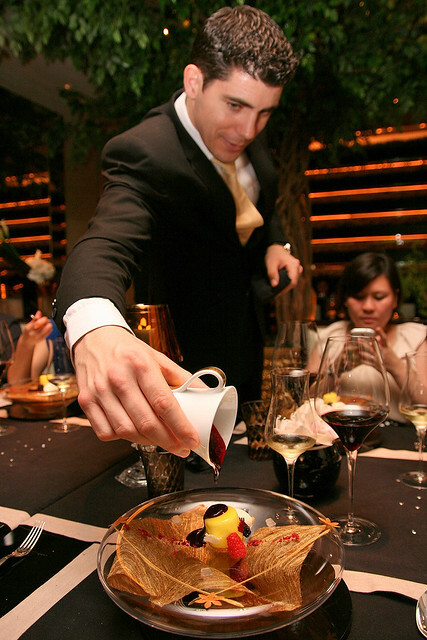 Guillaume pours a decadent sauce onto my dessert. Pity I was already too full to appreciate this! Petit fours with tea and coffee round off the meal - all very good but we were so stuffed already. But hey, I always appreciate fine-dining that fully satisfies in every way including portion sizes! So yes, there are some interesting culinary thrills among the new dishes, and they are already available at their respective restaurants. Note that they are open only for dinner. Bon appetit! Many thanks to RWS, the Joël Robuchon team, and Weber Shandwick for the invitation. i'm going on Tuesday. Excited! Excited for you too! Hope to read your review soon! Any zen master will tell you that what you perceive as "more real" or "more personal" are mere projections. Nothing is more real or less real. It is all projections, that only exist in the mind. Satori aside, I write as honestly as I can, because I want to record my own food experiences for myself. It may surprise you that I am not writing for you, but for myself. I write as though no one is reading. I write to please no one else. If the past few months seem off-kilter, it's because things are off-balance in my life too (some of you know what is going on). Hoping to get some semblence of sanity back. I can only clear backlog right now. But I do try to pick stuff that's interesting. To me, anyway.